Dental implants can be used to expertly provide you with a brand new smile in 24 hours. This is a technique is also known as all-on-4 and is used for patients with loose teeth, old crowns or failing dentures. Our expert dental technicians and implantologists collaborate to provide your dental implant solution on the very same day you have your implants fitted. If your dentures give you painful sores or make it difficult to speak and eat, same day teeth can restore your confidence and bring back your grin. Most traditional forms of implant procedures could require 6-10 dental implants. This significantly lengthens the time period it requires to heal and requires a greater depth of bone to be used. These methods may not be suitable for patients with reduced bone loss. Same day teeth, however, can provide patients who have suffered total tooth extraction with effective and fast treatment using just 4 implants, which act as anchors to stabilise an arch of full teeth. Less bone is needed in this technique as two dental implants are fitted at 45 degrees. This makes it more suitable for patients lacking in healthy bone. Same day teeth not only allow you to smile with confidence once again they also provide lift to the face, eliminating the sagging of skin around the jaw-line and the smile. This allows you to enjoy a more youthful profile. Are same day implants suitable for you? Do you have loose ill fitting dentures which affect your quality of life? Do you suffer from the advanced stages of periodontal disease? Do you have reduced bone in your jaw? Are your crowns or bridges starting to fail? Your new stabile arch can be cared for like your natural teeth. There’s no need to remove them at night or when you sit down to eat. A full arch of teeth lifts the shape of your face taking years off you. Food will taste as it should as the upper arch doesn’t cover the mouth’s roof. Same day implants can last a lifetime when cared for appropriately. The greater stability provided by the full arch prevents further bone loss. A brand new smile can be enjoyed in 24 hours. 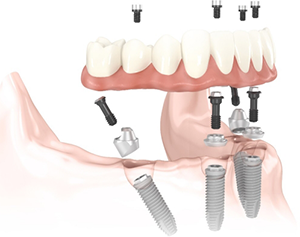 The S10 Dental team has extensive expertise and experience in fitting all-on-4 dental implants. Why delay any longer. Book a free cosmetic assessment and we will assess your suitability. Most people are great candidates for dental implants – which help us achieve aesthetic excellence.